Anderson's book examines how German attitudes toward African Americans and the institution of slavery changed over time. Kristen Anderson, associate professor, Department of History, Politics, and International Relations, has a new book out with Louisiana State University Press. 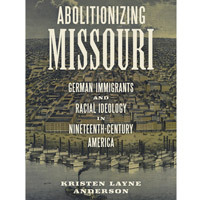 "Abolitionizing Missouri: German Immigrants and Racial Ideology in Nineteenth-Century America" examines the relationships between German immigrants and African Americans in St. Louis, Missouri, looking specifically at the ways in which German attitudes toward African Americans and the institution of slavery changed over time. Anderson, who specializes in 19th century U.S. social history, particularly the history of immigration, emancipation, and the Civil War, discussed her research on this book topic during the faculty "Talks of the Century" organized for Webster's centennial in 2015. Her work counters prevailing interpretations in immigration and ethnic history, where, until recently, scholars largely accepted that German immigrants were solidly antislavery. Instead, she uncovers a spectrum of Germans’ “antislavery” positions and explores the array of individual motives driving such diverse responses. Davina Harrison, resources management services assistant, and Heidi Vix, electronic resources librarian, Webster University Library, presented at the St. Louis Regional Library Network Tech Expo on March 9 at Logan University. Their presentation “LibAnswers for E-Resources” covered how they used a reference software platform for electronic resources troubleshooting and tracking. At the same event, Vix also presented “The Art of Negotiation” on negotiating with vendors and how to overcome the industry standard of a 5 percent annual increase for renewals. Robert Barnidge, lecturer and coordinator of International Relations, delivered the annual War on Terror lecture at High Point University in North Carolina on Thursday, March 24.